Box is in great condition. New ListingLuke Skywalker ANH Lightsaber Stand Master Replicas/ Hasbro New!! Not only is this replica a pristine and perfect recreation of the original prop, it is approved by the show's propmaster himself. That includes QMx's unique magnetic clasp, which uses strong, short-field magnets embedded in the badge and a separate backplate (included). 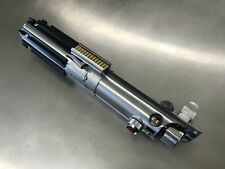 Graflex 2.0 MPP, Kenobi lightsaber prop hilt set. Graflex & MPP Machined to hold 7/8” blade. A great prop set at a great price. ESB blade tension screw included. I always use actual photos so what you see is what you get. Check out the pics to know just what you will be receiving. Batteries are not included. Look at the photos. This is a variant glove design. A variant because they're not exactly movie accurate they have subtle differences in the overall design that aren't found in the movie version particularly in the stitch work. PROPEL Star Wars T-65 X-Wing Star Fighter Quadcopter Collectors Edition Box. Star Wars Replica Vehicle. Multiple Flight Modes & Speed Settings. Flight Battery. Outer Box has minor wear and tear, inner box is sealed. Massive 48 in. Klingon Bat'Leth Style War Sword. 48" overall Full version of the Sword of Kahless first Bat?leth sword.It features an all stainless steel construction with sharp blades. The handle is wrapped with a genuine black leather wrap and has three holding spots. NEW Star Trek TNG Bluetooth Communicator Badge The Next Generation. Condition is New. Shipped with USPS First Class Package. PRODUCT PHOTOGRAPHS AS BLACK BUT HAS A GREY FINISH IN PERSON. • NOTE: I DO NOT HAVE OTHER RANK INSIGNIA. THIS IS ALL I HAVE. Star Wars Clone Trooper Pilot Gentle Giant Bust. In undamaged condition and has always been displayed in a glass enclosed curio cabinet in a non-smoking and non-pet environment. Comes with the original box and interior packaging, and numbered certificate of authenticity as shown. Will ship with its box bubble wrapped and surrounded by foam shipping peanuts in a large box for safer shipping. Please ask any questions and thanks for looking. Condition i s used. No t or ig in al p an ts. T hi s do ll h as the bo ot s as p ar t of h is l eg s and are n ot removable. So ld as is. 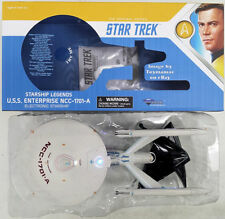 Vintage Star Trek V Die Cast ERTL Set of 2 - USS Enterprise Klingon Bird Of Prey. Condition is New. Shipped with USPS Priority Mail. Wonderful replica of one of Star Treks most important pieces of Landing party gear. Very detailed piece with light and sound effects as well. Really a nice piece for the Trekker. New in box perfect for your next away mission and to add to your collection. Star Trek: The Next Generation Galoob Tasha Yar Action Figure 1988. Condition is New. Shipped with USPS First Class Package. This is a Star Trek Trouble With Tribbles Bridge New No box still has Original foam. The front of the note is colorized to show the entire crew of the USS Enterprise, along with the official Star Trek 50. th anniversary of Star Trek. The legendary cult series first aired on NBC on September 8, 1966. Star Trek Original Series Science Tricorder Replica It's perfect for your next away mission! This authentic role-play plastic toy replica is based on the classic 23rd-century design. The 1:1 scale Electronic TOS Science Tricorder features silver highlights over a black finish, as well as the voice of Leonard Nimoy and light and sound effects taken fromStar Trek: The Original Series. A great addition to any collection. Star Wars Celebration Chicago 2019 Triple Zero 0-0-0 Bandai Model Kit Exclusive. Condition is New. Shipped with USPS Priority Mail. NOTE: I DO NOT HAVE OTHER RANK INSIGNIA. THIS IS ALL I HAVE. Badge is constructed from two piece design to allow for multiple finishes. Disco Silver Command Badge. Star Trek TNG Galoob Geordi LaForge Action Figure Brand New. Condition is New. Shipped with USPS First Class Package. Great Star Wars cooler. Does has a couple of minor condition issues see photos. 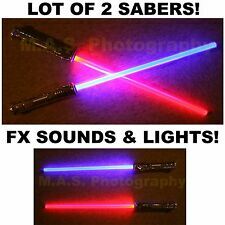 MPP Lightsaber Kit. MPP 2.0 Saber Kit. I apologize but there are no exceptions to this. Replica Klingon Bat'leth Sword Prop. This is the Klingon Warrior's weapon of choice, the Bat'leth! At a whopping four feet long it weighs in at over 5 lbs. The blade is stainless steel and has black leather wrapped handles. 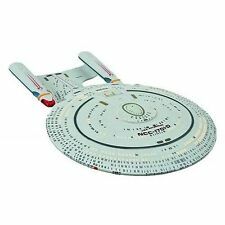 A refit version of NCC-1701 appears in the first three Star Trek films. (Star Trek III: The Search for Spock). TypeTouch Lamp&Table lamp&Desk Lamp. Acrylic top pieces Light passes through acrylic glass，3D Illusion Plate Only 4mm thick. All of QMx's Starfleet Division badges are exact replicas of the uniform insignia worn in the shows and movies, with each design taken directly from the screen-used hero prop. Not only are our replicas pristine and perfect recreations of the original prop, they are all approved by the show's propmaster himself. Star Wars Gentle Giant Darth Vader Animated Maquette. Displayed by an adult collector. Shipped with USPS Priority Mail. Please email me if you have any questions. What Are Some Ideal Collectibles to Look for When Starting a Science Fiction and Horror Collection? Science fiction and horror collectibles encompass many iconic television and film titles, including "Star Wars," "Buffy the Vampire Slayer," and "Dr. Who." When looking for valuable finds, items like action figures, pins, vehicle models, patches, trading cards, and apparel are ideal collectibles. Whenever possible, browse official and licensed items to discover authentic collectibles for your assortment of toys and treasures. What Are Some Tips for Collecting Action Figures? When first starting an action figure collection, focus on a specific theme to start with and do research to determine which toys you might want to look for first. Inspect toys for damage and blemishes, as action figures with missing limbs, worn paint, and missing accessories are often less valuable. If possible, look for complete toy sets that have all of the parts and even the original box. Attending toy conventions is a great way to get some advice from seasoned collectors. Finally, make sure that the action figures have proper care and storage, including clear cases for display in moisture-free places. How Should You Properly Package and Store Collectible Items? To maintain their value, take extra precaution when packaging and storing collectibles such as action figures, comic books, LEGO sets, and trading cards. Always lay comic books flat in a container, and if possible use protective Mylar sleeves to keep them separated. Store action figures and toys in original boxes, but keep them inside of containers and away from direct sunlight. Take extra precaution with breakable collectibles like plates, glassware, and fragile figurines, wrapping them in paper, soft cloth, or bubble wrap before placing them into containers. Fill empty spaces between fragile items using peanuts or extra bubble wrap, and stack lighter containers on top of heavier ones.